The Gnoming Librarian: Library GrabBag: Giant Games = Giant Fun! I had the great pleasure of presenting on giant games at a district library conference not too far from home last Friday morning. I've spoken about my Life Size Lock-In a time or two here on The Gnoming Librarian, but I thought I'd share my presentation info just in case there are any librarians out there interested in starting a giant gaming series in their neck of the woods. Kids, teens, adults, family…giant games are fun for all! GPL’s gaming events have brought in kids/teens/families that aren’t regular library users. Great passive programming opportunities! Consider adding to a gaming cabinet for patrons to use in the library, and they’re easy to pull out for impromptu events. Take them on the road! Giant games are great for outreach events and cooperative programs with organizations in your community. The larger gaming area is ideal for groups and teams! Create teams to support cooperative game play [Monopoly – (1) player on the board, (1) player managing properties and money]. You don’t need a lot of space to have a lot of fun! Giant board games create lots of laughter and competition without a lot of running around. 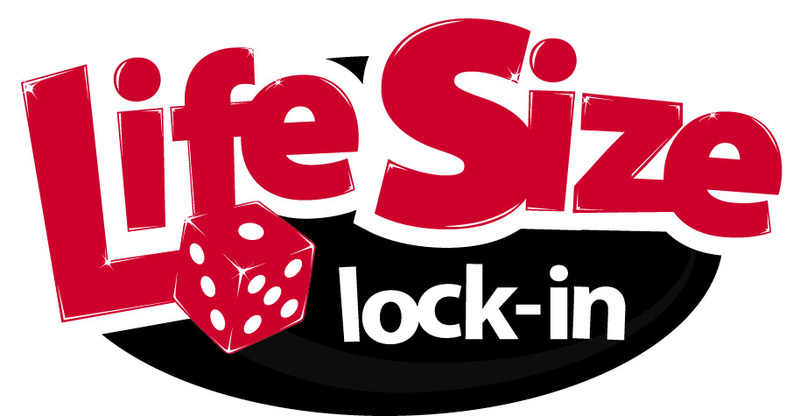 Just like purchasing a board game or piece of equipment, investing in life-size games is the program that keeps on giving! Offer multiple programs across multiple age groups to get your money’s worth. Seek out community partners and sponsorships to help fund your life size games. Is there an organization in your community that would also benefit from having access to the games? The PowerPoint is basically before and after pictures of different giant gaming attempts. We started out using poster board for Monopoly and Sorry. While I loved the size of the game board, storage and up keep was difficult. In order to make the game work, each poster board square had to be taped down on the floor which is a bit more time intensive than I had originally anticipated. We have since moved to painted canvas which is much easier to set up and store. Budget - A potential budget for Option (1) - Poster board and Option (2) - Canvas games. While the roll of canvas is a bit pricey, it's important to remember that one roll covered all the games. I did not have to buy a separate roll for each. A sample itinerary for our Life Size Lock In. During the breaks after each round where chaperones and our Teen Advisory Board hosts reset the room, we have the participants search the library for red paper dice. They write their name on each dice they find and place it in a bucket. At the end evening, we draw a red dice out of the bucket to award a prize. In the middle of the itinerary page is a sample assignment sheet for our TAB members. Each member usually supervises two games. The rest of the evening they are free to play. Our permission slips have come in handy a few times to make calls home to parents. After 8 years hosting the event with anywhere from 35-75 teens, I've only had to call home on two occasions. This is how we stay organized, assure that we don't have too many players in one room, and keep track of each of the teens in the building. When participants arrive for the event, they stop at a table and sign up for each round of games. The PDF shows a sample for Sorry. There are (4) rounds with the possibility of (8) players in each round. Teens may only sign up for a game once. We want to give everyone the chance to play everything. After filling out each round of play, they write that down on their dance card which they keep with them so that they know where to be and when. The game sign-up sheet stays with me. Throughout the evening I travel between the rooms where games are set up to count teens and make sure everyone is accounted for. We adjust the rules of the games to assure that as much fun can be had as possible in each 30-minute round. This is a sample of the rules for Candyland that we provide our TAB hosts and adult chaperones. It's a great event that brings in a lot of fabulous kids and teens. Each year is a little different, and we make adjustments to the number that may register and how many rounds we offer according to our current crowd. Let's face it. Some years are easier than others. I have found that the participants and chaperones alike have more fun when we stick to between 25-50 at the event as opposed to 75. Too many participants can sometimes be a distraction, especially for teens with special needs or on the spectrum. We want everyone who attends to have a good time. If you're interested in gaming and have some questions, please let me know!